In the most common interpretation of the poem, Blake implies that a visit by Jesus would briefly create heaven in England, in contrast to the "dark Satanic Mills" of the Industrial Revolution. Blake's poem asks four questions rather than asserting the historical truth of Christ's visit. Thus the poem merely implies that there may have been a divine visit, when there was briefly heaven in England. The original text is found in the preface Blake wrote for inclusion with Milton, a Poem, following the lines beginning "The Stolen and Perverted Writings of Homer & Ovid: of Plato & Cicero, which all Men ought to contemn: ..."
"Would to God that all the Lords[c] people were Prophets"
The phrase "dark Satanic Mills", which entered the English language from this poem, is often interpreted as referring to the early Industrial Revolution and its destruction of nature and human relationships. This view has been linked to the fate of the Albion Flour Mills in Southwark, the first major factory in London. This rotary steam-powered flour mill by Matthew Boulton and James Watt could produce 6,000 bushels of flour per week. The factory could have driven independent traditional millers out of business, but it was destroyed in 1791 by fire, perhaps deliberately. London's independent millers celebrated with placards reading, "Success to the mills of Albion but no Albion Mills." Opponents referred to the factory as satanic, and accused its owners of adulterating flour and using cheap imports at the expense of British producers. A contemporary illustration of the fire shows a devil squatting on the building. The mills were a short distance from Blake's home. Another interpretation, amongst Nonconformists, is that the phrase refers to the established Church of England. This church preached a doctrine of conformity to the established social order and class system, in contrast to Blake. In 2007 the new Bishop of Durham, N. T. Wright, explicitly recognised this element of English subculture when he acknowledged this alternative view that the "dark satanic mills" refer to the "great churches". In similar vein, the critic F. W. Bateson noted how "the adoption by the Churches and women's organizations of this anti-clerical paean of free love is amusing evidence of the carelessness with which poetry is read". Stonehenge and other megaliths are featured in Milton, suggesting they may relate to the oppressive power of priestcraft in general; as Peter Porter observed, many scholars argue that the "[mills] are churches and not the factories of the Industrial Revolution everyone else takes them for". An alternative theory is that Blake is referring to a mystical concept within his own mythology related to the ancient history of England. Satan's "mills" are referred to repeatedly in the main poem, and are first described in words which suggest neither industrialism nor ancient megaliths, but rather something more abstract: "the starry Mills of Satan/ Are built beneath the earth and waters of the Mundane Shell...To Mortals thy Mills seem everything, and the Harrow of Shaddai / A scheme of human conduct invisible and incomprehensible". The line from the poem "Bring me my Chariot of fire!" draws on the story of 2 Kings 2:11, where the Old Testament prophet Elijah is taken directly to heaven: "And it came to pass, as they still went on, and talked, that, behold, there appeared a chariot of fire, and horses of fire, and parted them both asunder; and Elijah went up by a whirlwind into heaven." The phrase has become a byword for divine energy, and inspired the title of the 1981 film Chariots of Fire, in which the hymn Jerusalem is sung. The plural phrase "chariots of fire" refers to 2 Kings 6:17. Blake lived in London for most of his life, but wrote much of Milton while living in the village of Felpham in Sussex. Amanda Gilroy argues that the poem is informed by Blake's "evident pleasure" in the Felpham countryside. The phrase "green and pleasant land" has become a common term for an identifiably English landscape or society. It appears as a headline, title or sub-title in numerous articles and books. Sometimes it refers, whether with appreciation, nostalgia or critical analysis, to idyllic or enigmatic aspects of the English countryside. In other contexts it can suggest the perceived habits and aspirations of rural middle-class life. Sometimes it is used ironically, e.g. in the Dire Straits song "Iron Hand". everyone in the task of speaking out about what they saw. Prophecy for Blake, however, was not a prediction of the end of the world, but telling the truth as best a person can about what he or she sees, fortified by insight and an "honest persuasion" that with personal struggle, things could be improved. A human being observes, is indignant and speaks out: it's a basic political maxim which is necessary for any age. Blake wanted to stir people from their intellectual slumbers, and the daily grind of their toil, to see that they were captivated in the grip of a culture which kept them thinking in ways which served the interests of the powerful. The words of the poem "stress the importance of people taking responsibility for change and building a better society 'in Englands green and pleasant land.'" The poem, which was little known during the century which followed its writing, was included in the patriotic anthology of verse The Spirit of Man, edited by the Poet Laureate of the United Kingdom, Robert Bridges, and published in 1916, at a time when morale had begun to decline because of the high number of casualties in World War I and the perception that there was no end in sight. Under these circumstances, Bridges, finding the poem an appropriate hymn text to "brace the spirit of the nation [to] accept with cheerfulness all the sacrifices necessary," asked Sir Hubert Parry to put it to music for a Fight for Right campaign meeting in London's Queen's Hall. Bridges asked Parry to supply "suitable, simple music to Blake's stanzas – music that an audience could take up and join in", and added that, if Parry could not do it himself, he might delegate the task to George Butterworth. The poem's idealistic theme or subtext accounts for its popularity across much of the political spectrum. It was used as a campaign slogan by the Labour Party in the 1945 general election; Clement Attlee said they would build "a new Jerusalem". It has been sung at conferences of the Conservative Party, at the Glee Club of the British Liberal Assembly, the Labour Party and by the Liberal Democrats. 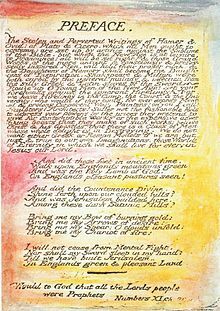 In adapting Blake's poem as a unison song, Parry deployed a two-stanza format, each taking up eight lines of Blake's original poem. He added a four-bar musical introduction to each verse and a coda, echoing melodic motifs of the song. The word "those" was substituted for "these" before "dark satanic mills". Davies arranged for the vocal score to be published by Curwen in time for the concert at the Queen's Hall on 28 March and began rehearsing it. It was a success and was taken up generally. I wish indeed it might become the Women Voters' hymn, as you suggest. People seem to enjoy singing it. And having the vote ought to diffuse a good deal of joy too. So they would combine happily. Accordingly, he assigned the copyright to the NUWSS. When that organisation was wound up in 1928, Parry's executors reassigned the copyright to the Women's Institutes, where it remained until it entered the public domain in 1968. The song was first called "And Did Those Feet in Ancient Time" and the early published scores have this title. The change to "Jerusalem" seems to have been made about the time of the 1918 Suffrage Demonstration Concert, perhaps when the orchestral score was published (Parry's manuscript of the orchestral score has the old title crossed out and "Jerusalem" inserted in a different hand). However, Parry always referred to it by its first title. He had originally intended the first verse to be sung by a solo female voice (this is marked in the score), but this is rare in contemporary performances. Sir Edward Elgar re-scored the work for very large orchestra in 1922 for use at the Leeds Festival. Elgar's orchestration has overshadowed Parry's own, primarily because it is the version usually used now for the Last Night of the Proms (though Sir Malcolm Sargent, who introduced it to that event in the 1950s, always used Parry's version). Although Parry composed the music as a unison song, many churches have adopted "Jerusalem"; English cathedrals, churches and chapels frequently use it as an office or recessional hymn on Saint George's Day. However, some clergy in the Church of England, according to the BBC TV programme Jerusalem: An Anthem for England, have said that the song is not technically a hymn as it is not a prayer to God (which they claim hymns always are, though many counter-examples appear in any hymnal). Consequently, it is not sung in some churches in England. Despite this, it was sung as a hymn during the wedding of Prince William and Catherine Middleton in Westminster Abbey. Many schools use the song, especially public schools in Great Britain (it was used as the title music for the BBC's 1979 series 'Public School' at Radley College), and several private schools in Australia, New Zealand, New England and Canada. "Jerusalem" was chosen as the opening hymn for the London Olympics 2012, although "God Save the Queen" was the anthem sung during the raising of the flag in salute to the Queen. Some attempts have also been made to increase its use elsewhere with other words; examples include the State Funeral of President Ronald Reagan in Washington National Cathedral on 11 June 2004 and the State Memorial Service for Australian Prime Minister Gough Whitlam on 5 November 2014. Upon hearing the orchestral version for the first time, King George V said that he preferred "Jerusalem" over the British national anthem "God Save the King". "Jerusalem" is considered to be England's most popular patriotic song; The New York Times said it was "fast becoming an alternative national anthem," and there have even been calls to give it official status. England has no official anthem and uses the British national anthem "God Save the Queen", also unofficial, for some national occasions, such as before English international football matches. However, some sports, including rugby league, use "Jerusalem" as the English anthem. "Jerusalem" is the official hymn of the England and Wales Cricket Board, although "God Save the Queen" was the anthem sung before England's games in 2010 ICC World Twenty20 and 2010–11 Ashes series. Questions in Parliament have not clarified the situation, as answers from the relevant minister say that since there is no official national anthem, each sport must make its own decision. As Parliament has not clarified the situation, Team England, the English Commonwealth team, held a public poll in 2010 to decide which anthem should be played at medal ceremonies to celebrate an English win at the Commonwealth Games. "Jerusalem" was selected by 52% of voters over "Land of Hope and Glory" (used since 1930) and "God Save the Queen". In 2005 BBC Four produced Jerusalem: An Anthem For England highlighting the usages of the song/poem and a case was made for its adoption as the national anthem of England. Varied contributions come from Howard Goodall, Billy Bragg, Garry Bushell, Lord Hattersley, Ann Widdecombe and David Mellor, war proponents, war opponents, suffragettes, trade unionists, public schoolboys, the Conservatives, the Labour Party, football supporters, the British National Party, the Women's Institute, a gay choir, a gospel choir, Fat Les and naturists. "When the Apple Blossoms Bloom in the Windmills of Your Mind I'll Be Your Valentine"
(1973) "Fanfare for the Common Man"
In 1973, for their Brain Salad Surgery album, British progressive rock band Emerson, Lake & Palmer recorded a version of the song titled "Jerusalem". The track features the debut of the prototype Moog Apollo, the first-ever polyphonic music synthesizer. The subject matter of this song indicates a nod to ELP's unabashed Englishness and simultaneously lent an air of timeless tradition and ceremony to the music. Though a single was released of the song, it failed to chart, and it was banned from radio play in England. The BBC would not accept it as a serious piece of music, the band claims. Drummer Carl Palmer later expressed disappointment over this decision. We wanted to put it out as a single ... We figured it was worthy of a single. In England, they have this format where four or five people have to [approve it] before it gets played on the airwaves; it's a very old-fashioned way of doing it, but that's the way it was being done at the time. I think there was some apprehension [as] to whether or not we should be playing a hymn and bastardizing it, as they said, or whatever was being called at the time ... We thought we'd done it spot-on, and I thought that was very sad because I've got a jukebox at home, and that's a piece of music that I've got on the jukebox, so I actually thought the recording and just the general performances from all of us were absolutely wonderful. I couldn't believe the small-mindedness of the English ... committee to vote these things onto the radio or off the radio. They ... obviously didn't even listen to this. It got banned and there was sort of quite a big thing about it, these people just would not play it. They said no, it was a hymn, and we had taken it the wrong way. A live rendition was recorded during their subsequent Someone Get Me a Ladder tour, and was included on Welcome Back, My Friends, to the Show That Never Ends ~ Ladies and Gentlemen... Emerson, Lake & Palmer! The popularity of Parry's setting has resulted in many hundreds of recordings being made, too numerous to list, of both traditional choral performances and new interpretations by popular music artists. Consequently, only its most notable performances are listed below. Annually—It is sung every year by an audience of thousands at the end of the Last Night of the Proms in the Royal Albert Hall and simultaneously in the Proms in the Park venues throughout the country. Annually—Along with "The Red Flag", it is sung each year at the closing of the annual Labour Party conference. Annually—It is traditionally sung before rugby league's Challenge Cup Final, along with "Abide with Me", and before the Super League Grand Final, where it is introduced as "the rugby league anthem". Before 2008, it was the anthem used by the national side, as "God Save the Queen" was used by the Great Britain team: since the Lions were superseded by England, "God Save the Queen" has replaced "Jerusalem". 1920s—The song was used by the National Union of Women's Suffrage Societies (indeed it was their property until 1928, when they were wound up after women won the right to vote – see above in relation to Millicent Garret Fawcett). During the 1920s, many Women's Institutes (WI) started closing meetings by singing it, and this caught on nationally. Although it has never actually been adopted as the WI's official anthem, in practice it holds that position, and is an enduring element of the public image of the WI. 1986—The Waterboys have incorporated verses into live performances of "Savage Earth Heart". 1991—The extended version of dance group The KLF's hit single "It's Grim Up North" incorporates Parry's setting of the poem. 2004—present—Since 2004, it has been the anthem of the England cricket team, being played before each day of their home test matches. 2009—At a concert at the Royal Albert Hall on 4 July 2009, Jeff Beck performed a version featuring his touring band at the time (Vinnie Colaiuta, Tal Wilkenfeld and Jason Rebello) and a guest appearance by David Gilmour. 2010—A recording by the Grimethorpe Colliery Band was played in medal ceremonies when an English competitor at the 2010 Commonwealth Games was awarded gold. 2011—It was one of three hymns sung at the wedding of Prince William, Duke of Cambridge, and Catherine Middleton. 2011—While performing at Glastonbury in June 2011, U2's Bono incorporated one of the verses into their songs "Where The Streets Have No Name" and "Bad". Whilst being interviewed after the gig, he said it was a tribute to Glastonbury's historical significance. 2012—It was used in the opening ceremony of the 2012 Summer Olympics held in London and inspired several of the opening show segments directed by Danny Boyle. It was included in the ceremony's soundtrack album, Isles of Wonder. 2016—An a cappella version by Jacob Collier was selected for Beats by Dre "The Game Starts Here" for the England Rugby World Cup campaign. "Bring me my Chariot of fire" inspired the title of the film Chariots of Fire. A church congregation sings "Jerusalem" at the close of the film and a performance appears on the Chariots of Fire soundtrack performed by the Ambrosian Singers overlaid partly by a composition by Vangelis. One unexpected touch is that "Jerusalem" is sung in four-part harmony, as if it were truly a hymn. This is not authentic: Parry's composition was a unison song (that is, all voices sing the tune – perhaps one of the things that make it so "singable" by massed crowds) and he never provided any harmonisation other than the accompaniment for organ (or orchestra). Neither does it appear in any standard hymn book in a guise other than Parry's own, so it may have been harmonised specially for the film. The film's working title was "Running" until Colin Welland saw a television programme, Songs of Praise, featuring the hymn and decided to change the title. The hymn has featured in many other films and television programmes including Four Weddings and a Funeral, How to Get Ahead in Advertising, The Loneliness of the Long Distance Runner, Calendar Girls, Star Trek: Deep Space Nine, Goodnight Mr. Tom, Women in Love, The Man Who Fell to Earth, Shameless, and Monty Python's Flying Circus. An extract was heard in the 2013 Doctor Who episode "The Crimson Horror" although that story was set in 1893, i.e., before Parry's arrangement. A punk version is heard in Derek Jarman's 1977 film Jubilee. In an episode of Peep Show, Jez (Robert Webb) records a track titled "This Is Outrageous" which uses the first and a version of the second line in a verse. A modified version of the hymn, replacing the word "England" with "Neo", is used in Neo Yokio as the national anthem of the eponymous city state. In the theatre it appears in Jerusalem, Calendar Girls and in Time and the Conways. Eddie Izzard discusses the hymn in his 2000 Circle stand-up tour. Punk band Bad Religion have borrowed the opening line of Blake's poem in their "God Song", from the 1990 album Against the Grain. Blake's lyrics have also been set to music by other composers without reference to Parry's melody. Tim Blake (synthesiser player of Gong) produced a solo album in 1978 called Blake's New Jerusalem, including a 20-minute track with lyrics from Blake's poem. Mark E. Smith of The Fall interpolated the verses with a deadpan rant against his native land in the track "Dog is life/Jerusalem" from the 1988 ballet score "I Am Kurious Oranj". The words, with some variations, are used in the track "Jerusalem" on Bruce Dickinson's album The Chemical Wedding, which also includes lines from book two of Milton. Finn Coren also created a different musical setting for the poem on his album The Blake Project: Spring. The Verve also referenced the song in their 2008 song Love Is Noise from the album Forth. Lead singer and writer Richard Ashcroft said that Blake had influenced the lyric 'Will those feet in modern times' from the song. This is not the first Verve song influenced by Blake, as their previous single History also featured the lyrics "I wandered lonely streets/Behind where the old Thames does flow/And in every face I meet", referencing Blake's "London". ^ The hymn 'Jerusalem the Golden with milk and honey blessed... I know not oh I know not what joys await me there....' uses Jerusalem for the same metaphor. "And all the Arts of Life they changed into the Arts of Death in Albion. ^ Peter Stanford, "Did Jesus REALLY stay in England? A new film claims he built a church in Somerset and learnt maths from the Druids", Daily Mail, 27 November 2009. Retrieved 2016.10.21. ^ "The One Show". BBC. 17 October 2008. Retrieved 29 April 2011. ^ a b Blake, William. "Milton a Poem, copy B object 2". The William Blake Archive. Ed. Morris Eaves, Robert N. Essick, and Joseph Viscomi. Retrieved 1 March 2010. ^ "Numbers 11:29". King James Version. biblegateway.com. ^ Hall, Ernest (8 February 1996). "In Defense of Genius". Annual Lecture to the Arts Council of England. 21st Century Learning Initiative. Archived from the original on 25 October 2008. Retrieved 19 September 2009. ^ Peter Porter, The English Poets: from Chaucer to Edward Thomas, Secker and Warburg, 1974, p.198., quoted in Shivashankar Mishra, The Rise of William Blake, Mittal Publications, 1995, p.184. ^ Blake, William, Milton: A Poem, plate 4. ^ Gilroy, Amanda (2004). Green and Pleasant Land: English Culture and the Romantic Countryside. Peeters Publishers. p. 66. ^ Liukkonen, Petri. "William Blake". Books and Writers (kirjasto.sci.fi). Finland: Kuusankoski Public Library. Archived from the original on 26 January 2012. ^ Carroll, James (2011). Jerusalem, Jerusalem: How the Ancient City Ignited Our Modern World. Houghton Mifflin Harcourt. p. 236. ISBN 978-0-547-19561-2. ^ Bridges, Robert, ed. (January 1916). "Index". The Spirit of Man: An Anthology in English & French from the Philosophers & Poets (First ed.). Longmans, Green & Co. p. 335. Retrieved 10 September 2012. ^ Carroll, James (2011). Jerusalem, Jerusalem: How the Ancient City Ignited Our Modern World. Houghton Mifflin Harcourt. p. 235. ISBN 978-0-547-19561-2. ^ "Link to PBS script quoting Attlee in 1945 – Accessed 7 August 2008". Pbs.org. 24 October 1929. Archived from the original on 16 May 2011. Retrieved 29 April 2011. ^ "What does it really mean to be English? Nothing at all – and that's how it should be". The Daily Telegraph. 24 April 2012. ^ Christopher Wiltshire (Former archivist, British Federation of Festivals for Music, Speech and Dance), Guardian newspaper 8 December 2000 Letters: Tune into Jerusalem's fighting history The Guardian 8 December 2000. ^ ICONS – a portrait of England. Icon: Jerusalem (hymn) Sir Hubert Parry Archived 9 August 2011 at the Wayback Machine, "Jerusalem" and Elgar's orchestration. ^ Jerusalem: An Anthem for England. BBC Four. 8 July 2007. ^ Borland, Sophie (10 April 2008). "Cathedral bans popular hymn Jerusalem". The Daily Telegraph. London. Archived from the original on 11 April 2008. Retrieved 11 April 2008. ^ "Royal Wedding: Prince William and Kate Middleton choose popular hymns", The Telegraph, 29 April 2011. Retrieved 29 April 2011. ^ a b c Brantley, Ben (20 July 2009). "Time, and the Green and Pleasant Land". The New York Times. Retrieved 23 April 2010. ^ "Correspondence". UK: Anthem 4 England. 8 May 2007. Retrieved 29 April 2011. ^ Sir Andrew Foster (30 May 2010). "England announce victory anthem for Delhi chosen by the public! – Commonwealth Games England". Weare England. Archived from the original on 11 June 2011. Retrieved 29 April 2011. ^ "Jerusalem: An Anthem for England (TV 2005)". Internet Movie Database. Retrieved 27 September 2011. ^ Sam Wollaston (9 September 2005). "Get me to the clink on time". The Guardian. UK. Retrieved 28 September 2011. ^ a b "Liner Notes from the DVD-A of Brain Salad Surgery". Ladies of the Lake – A Greg Lake Tribute Site. Retrieved 2 September 2014. ^ "Link to SongFacts – Accessed 7 August 2008". Songfacts.com. Retrieved 29 April 2011. ^ Nation has chosen anthem for England's medallists: And did those feet in Ancient times walk upon England’s mountains green..., Commonwealth Games England, May–June 2010, archived from the original on 9 October 2010, retrieved 13 October 2010, Now we can reveal that the anthem has been recorded for us by The Grimethorpe Colliery Band...The new official anthem of the England Team will be played for English athletes on the podium in Delhi when a Gold medal is won. ^ "Music for the Wedding Service". Official Royal Wedding 2011 (Blog). 28 April 2011. Archived from the original on 29 April 2011. Retrieved 28 April 2011. ^ "Navigating the 'Isles of Wonder': A guide to the Olympic opening ceremony". CNN. Retrieved 28 July 2012. ^ "England rugby captain stars in Beats By Dre campaign". Retrieved 28 June 2016. ^ "Jerusalem – Jacob Collier (Soundtrack for Beats by Dre: "The Game Starts Here")". Retrieved 28 June 2016. ^ Toole, Mike (September 19, 2017). "Neo Yokio Review". Anime News Network. Retrieved September 26, 2017. Neo Yokio's national anthem is William Blake's 'Jerusalem,' and fight scenes are underpinned by tunes by the likes of Mingus. ^ https://www.youtube.com/watch?v=9rXLSWrFVqg The Verve – Love is Noise (Interview) – "Look at it in the first few lines, as a kind of remake of Jerusalem by William Blake, rather than those feet in ancient times, its those feet in modern times."